We chatted briefly with Holmes about Greene and Mobley’s brief chat. This interview has been lightly edited and condensed for clarity. The Takeout: So, have any thoughts on Slate’s piece? 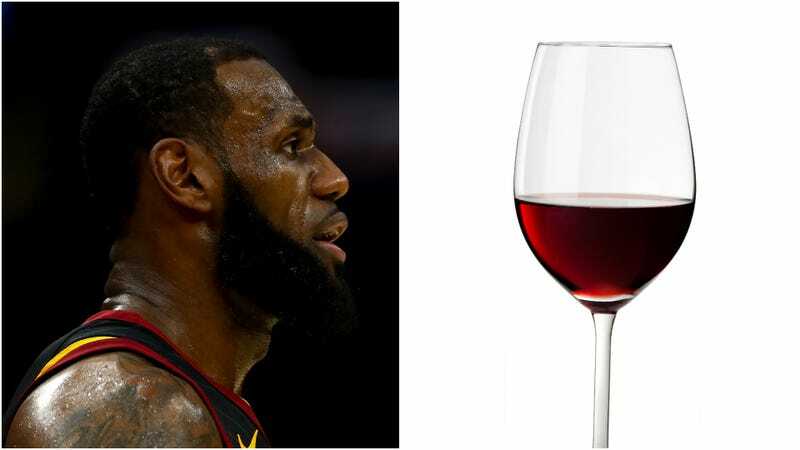 Baxter Holmes: The first thing I would say is that LeBron, because of who he is, his access to people, his celebrity—he would be able to drink truly excellent wine, whatever he desires, wherever he goes. So I don’t know that being in a region where he might have more direct access is super high up on his list. If he’s still is incredibly hungry to win a championship, which I fully expect and believe he is, I think basketball would be at the top of his list. I think his family and business are high up there as well. Somewhere in there, a little bit further down the totem pole, I’m sure it wouldn’t hurt if he was in area where maybe he could pop over to some wine-rich region that wasn’t too far away. But he can just hop on a plane and go wherever he might like on the planet for that. TO: Do you think he’s likely to gravitate toward a team with other wine-lovers? Other Banana Boat Tasting Group members, perhaps? BH: Some of the relationships he’s made over the years, deep friendships—which I should add have probably been bolstered by many late-night (and pretty excellent) glasses of wine—will definitely come into play in his thought process as he considers. There’s been there long been chatter that one of the teams that he might potentially be interested in, or which would be potentially interested in him, is the Houston Rockets. That’s the team with Chris Paul, someone with whom LeBron has had plenty of great wine, as part of the Banana Boat Tasting Group. There’s no doubt their friendship is incredibly strong, that’s a certainly a kinship that they share. TO: I know this is a pipe dream, but be gentle: Is there any chance that he could say, “Man, I would love to be closer to some great Oregon pinot noirs.” Is there any hope for my beloved Portland Trail Blazers? BH: A lot of it I think comes down to finances, whether they’re under cap space and could afford a player of LeBron’s caliber and salary. I’ll be the first to admit, I am not our salary cap guru. I couldn’t, off the top of my head, describe their current salary cap situation. But I will say that LeBron has been on record that he very much enjoys Oregon pinot noirs. I’m not sure how feasible it is basketball-wise, but I’m sure that if he had more access to good wines of that kind, I don’t think it would be a hindrance. TO: Thank you so much for engaging in this extremely silly conversation with me. BH: Sure. I enjoyed the interview with Esther. The notion of him being closer to Napa is kind of fun to think about, that’s an area he’s very, very fond of. And it’s an area that’s incredibly fond of him. But he’ll spend as much time as he wants in Napa, or anywhere else, regardless of where he is.